The wrong note played with gusto always sounds better than the right note played timidly. Today's wisdom comes from Tommy Jordan, co-founder of the alternative rock band Geggy Tah. 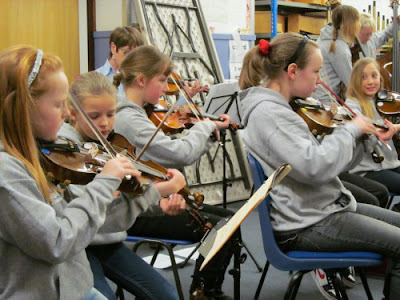 I took the photo of notes being played with gusto in 2012 at a school in Norwich during an In Harmony session. However, as members of the Britten Sinfonia were working with the young musicians, the notes played with gusto were also right. As part of the In Harmony project I was privileged to present a performance by the youngsters that preceded a Britten Sinfonia concert with Pekka Kuusisto playing Thomas Adès' Violin Concerto. More on that story in Music on the other side of the great celebrity divide. Also on Facebook and Twitter. Any copyrighted material is included as "fair use", for the purpose of critical analysis only, and will be removed at the request of copyright owner(s).